Oology is an egg-centric restaurant located along the coast of La Jolla, just overlooking the cove. The restaurant was started by a husband and wife team, inspired by their love of the humble yet versatile egg. 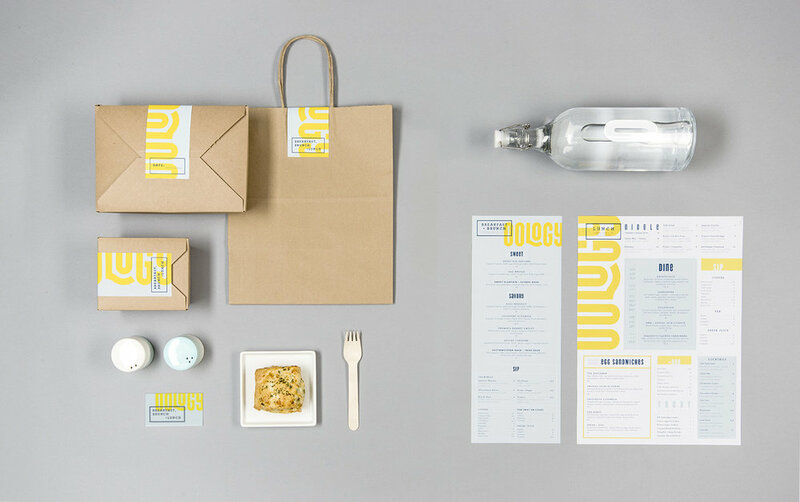 With the restaurant’s growing popularity, they wanted to develop a cohesive, cost effective, and environmentally friendly branding system for their menu and take-out packaging that reflects the laid back feel of this waterfront brunch spot. The color scheme of bright yellow and pastel blue were selected to create a sense of refreshment and to give brunchers a taste of coastal living. The bold headers of each section of the main menu help draw the eyes from section to section in this unusual menu layout. Biodegradable carry-out packaging made from recycled paper in a kraft brown color added a natural and organic touch to the clean linework and vibrancy of the menu. Branded sleeves of the same material for hot and cold beverage cups were chosen over the pricier option of branded cups. Custom stickers were also created to be used to seal and date the various sizes of boxes as well as the carry-out bags.